"Especially the breakfast at the cottage is wonderful!!" Have a question for Villa Chempaka Hotel? Whether on business or vacation, Villa Chempaka Hotel is within easy reach of most tourist attractions and business addresses in Bali. This charming boutique hotel features 10 thatched roof cottages featuring marble floors, a small plunge pool, and a veranda, all designed in a traditional Balinese style and equipped with modern day comforts. The hotel is famous for its attentive personal service, and every morning, the friendly staff serve breakfast on the veranda. Located amidst beautiful surroundings, Villa Chempaka Hotel has long been a lure to artists and tourists from all over the world. Sophisticated and traditionally decorated, comfortable beds, breakfast services are commendable. Very friendly staff, owner himself visits the property daily. Enjoyed our stay , a definite stay on revisit. My fiancee and I really enjoyed this place. It's a five minute walk from the main highway, but that was OK because there are plenty of restaurants and stores that don't require you to go all the way to the main street. It was also far away from all the traffic, and very quiet. The room was basic, moderately insulated. We did have to kill quite a few mosquitoes, but I travel with one of those electric tennis racket mosquito killers, so it was fine. The breakfast was basic but good. Would recommend if on a budget. If icould stay here longer. There is no tv, I can hear the nature . Especially the breakfast at the cottage is wonderful!! The cottages were clean and acceptable, but booking was confirmed for a bigger venue and we were given a different cottage! The place was over prized comparatively to others similar ones around that area. The wifi was not at all stable and we had to invest on a simcard with internet excess to resume work...which made the stay expensive at this place. The hotel consists of several villas. Although the rooms are older, they are adequate. What is outstanding is the staff service they are friendly and always helpful. There is no restaurant or food service, but there are several excellent restaurants within walking distance. You order breakfast and delivery time the night before but there is very little selection and gets old after a day or two. The hotel next door can be noisy. The staff were friendly and helpful, the hotel is located near restaurants, cafes, and shops, the surroundings is very peaceful. Beautiful gardens. Lovely attentive staff. Close to restarants, shops and market. We enjoyed our stay very much as close to everything we wanted, restaurants, massage spas and shops. It was a little too quiet for a city folk like myself as you can hear cicadas & toads & birds thruout the day & night. Not for those with a faint heart. Location within walking distance to city centre, natural village and rice field surrounding and very attentive services. This boutique self managed hotel with approximately 10 bungalows and less than 10 permanent staff characterize Ubud traditional accomodation against international hotel chain. The room facing the rice field and the surrounding still have Ubud village character, but yet we are 5 minutes walk to various spa and international restaurants. The building and interior is old but functioning well and very strong refection of Balinese traditional architecture and interior. Braekfast is provided in your private terrace facing the rice field. This hotel, consisting of stand-alone cottages, is in a quiet location with views of the rice paddies and croaking frogs. Yet, it is only a ten-minute walk to the very centre of Ubud, with a good choice of restaurants close by. The family that runs the hotel is very friendly and helpful. Western breakfast is served on the veranda of your cottage. This hotel had the best wi-fi of any hotel I stayed at in Indonesia during my two-week trip. I would recommend this hotel highly. Just out of the way location; friendly staff; beautiful and quiet. i loved this place - it was my idea of luxury - ten bungalows in a garden with a small pool, a few minutes walk from the main road. i spent several days there with no desire to move on. the room was excellent - spacious with a balcony. a clue that the owner had got his priorities right was that there was no tv in the room. the breakfast, which you had to order in the evening for them to bring it to your bungalow at the requested time the next morning, was nothing special. but the best thing about this was that it meant i could eat my breakfast sitting on the balcony in my pyjamas. Located near a rice field. The campus is a garden, with small swimming pool. Staffs are prompt and helpful with smile. Breakfast in the verandah is superb. A real 'can-do' attitude prevails here from the friendly staff who make the most amazing breakfasts, brought each morning to your balcony overlooking the small rice paddy-field next to the hotel. be sure to try the gado-gado or nasi goreng, as it may not be offered but they're happy to make it. A small dip-pool is next to the rooms and a nice way to cool off, and the internet signal is reliable and strong nearer to the reception building. Nice spacious rooms, thatched ceilings, good air-con, perhaps a little on the dark side, but good for keeping the heat of the day out. Overall, a wonderful, economical and friendly choice! Clean, beautiful rooms. Near Ubud center. Professional, friendly staff. I stayed at Villa Cempaka from November 30 through December 28, 2012. 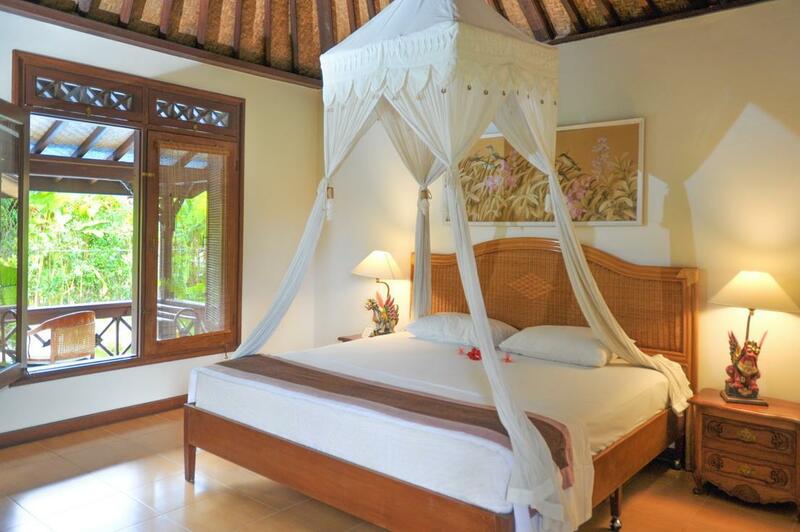 Villa Cempaka is restful and quiet. The staff is professional and friendly. I enjoyed my stay very much. Villa Cempaka is just a short walk (10 minutes or so) from the center of Ubud and a few more minutes from main shopping streets. If you don't feel like walking in the heat, taxis are everywhere, easy to find and cheap. Villa Cempaka is near a number of restaurants and venues for dance performances. Tours of Bali are easy to arrange with taxi drivers on the street. I typically paid about $40 dollars for a car and driver for a day (around six hours of sightseeing - which is plenty). If you are interested, be sure to visit arts/crafts makers in nearby Mas, Singapadu, Batuan and other villages. None are far away and if you like very fine masks, wood carving and beautiful weaving, visits are well worth the time. I notice in their reviews that some people complain about the breakfasts (typically eggs, fruit, toast and jam, and coffee or tea), but on my second or third day, the staff volunteered that I could have any sort of breakfast I wanted, so for most of my visit I had double portions of succulent ripe mango and strong coffee. Ubud is generally a fairly subdued and restful place. Bring a loaded Kindle or plenty of books. It's a good place from which to tour all of Bali and a far cry from the swarms of drunken Australians in Kuta. Villa Cempaka is not the Four Seasons or a high end resort. If that's what you want and you can afford it, you can find many such luxury resorts in Ubud. But if you want a quiet, clean, attractive, friendly place to stay - somewhere convenient to Ubud sights and shopping, then you can't do better than Villa Cempaka. I am 30 and traveled with my aged parents. This hotel locates in a quiet alley behind the busy street. 20 minutes walking distance to the Palace of Ubud. (3-5 minutes driving cost 20,000-30,000 Indonesian Rupiah equal to 2-3USD). If you like to stay in a quiet area but not far from the central of Ubud, this hotel is a good choice. Hotel room is big enough and clean however there are ants in the room and I also found several on the bed, live in a villa room it is normal. Don't worry ants don't bite only mosquitos do. Hotel has changeover plug,electric mosquito repellent and hair dryer but not in the room, just ask staffs there, they will provide all to you. Staffs there are really lovely and helpful, especially a order staff named Ketuta Nayanan, he has really good english and knows everything in local, feel free to ask him, he is lovely! Staffs there helped me to book taxis restaurants and spas I would like to go with local language, it made things really easy and i didnt even bother to buy local sim card. You can also book day tour from hotel or let staff make recommendations, check the reasonable prices beforehand is my advice and then feel free to make a bargain. the rooms are abit old. there was a safe and TV too which was probably from the 90's. i stayed in the standalone chalet. the pool is right beside the restaurant where people have breakfast or outsiders come for dinner. Breakfast Included : The menu was okay where you get abit of bread and fruits and cereal. You also get to order 2 items from their menu which is ok. Service on the day i was there wasnt good. i had to get the menu myself and keep calling for someone to come take my order.